The person close to you who about to turn 50 may have been dreading this event. 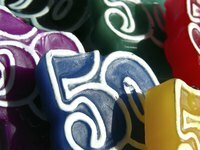 Fiftieth birthday pranks are a time-honored rite of passage that no half-centenarian should be allowed to escape. It's all in fun, of course. Aging well requires a sense of humor. Take advantage of how much has changed in the past 50 years. Comfort House is one company that can obtain an actual newspaper from the guest of honor's date of birth for you. Use such a paper, or simply research the events of that historic day and year. Infuse elements from the 50-year-old news into the theme of your party and the moments building up to it. For instance, prior to the party, have friends or coworkers casually discuss the news of "the day," such as, "...yeah, it looks like Kennedy's getting the Democratic nomination..." and then drop the subject. At the party itself, recreate as completely as possible the setting, decor and social spirit of 50 years previous. Simulate rapid aging by altering the difficulty level of simple tasks around the house. Tighten jar lids with tools. A few stitches added to shirt button holes will make buttoning an exercise in frustration. Replace the elastic waistband of a skirt with one much shorter. Smear petroleum jelly on mirrors to make vision blurry. Alter the speaker set-up of your home entertainment system so that volume is inaudibly low. Your response to the birthday celebrant's complaints should be, "Seems fine to me. You're just getting old." A visit to the birthday person's old elementary school, or a chat with his or her parent, sibling or life-long friend, may help you obtain the names of some folks your mark attended first or second grade with—someone your half-centenarian is not likely to remember. Sneak a peak in a yearbook or go to the school's website for alumni. If the person is willing, have him come to the door to deliver flowers or a package. He can then say something like, "You look familiar. Do I know you?" Your mark probably won't be able to place the person, due, undoubtedly to her "failing" memory. The player, however, will quickly recall the locale of the connection, will be able to describe memories from long ago, and may remark, "I've known you 44 years and you've completely forgotten who I am!" If you can't find someone from your mark's school, get someone who is closer to 70 years old to play the part of a classmate from long ago. The more relevant information you supply this actor with, the better you will confuse, baffle and torment your unsuspecting mark. Be sure to balance out all this good-humored pranking with a well-chosen gift and some kind words in a card.